Would you like to see education become “funny, friendly, and freaking fantastic”? Are you comfortable writing academically and lesson planning at the Masters and Ph.D. level? Would you like to do all of this while working from home? Then Shmoop might be something for you to look into. Shmoop is an Internet learning company founded in 2008 and headquartered in Mountain View, California. While the majority of their employment-type jobs are for those living in the Mountain View area, they do offer occasional freelance/remote work which can be done at home. However, most of their remote/freelance/telecommuting work is posted on the FlexJobs website. Most of these freelance jobs are for writers, but more on that later on in the article. Just looking at Shmoop’s website should give you an indication of not only their humor and fun approach to learning, but also the passion and mission that they have to help students do well on everything from SATs to understanding the great works of literature. Teaching resources such as flashcards and videos are offered on the website. What Types of Jobs Are Offered at Shmoop? 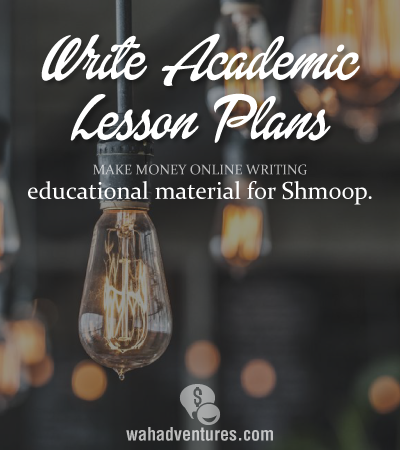 Shmoop offers a variety of jobs in both technical development and as well as educational development for those who can write lesson plans and curriculum at the Masters or Ph.D. levels. The jobs and job titles available would be comparable with any mid-size corporation. To be able to work at Shmoop, you must be able to show proof that you can work in the U.S. and many times you will need a Masters or Ph.D. in your field of expertise. The remote/freelance/telecommuting jobs will vary, but even most—not all—of them do require a Masters or Ph.D. So read carefully all jobs with their requirements before applying. The first job required a Masters or Ph.D. in Education, but the second one did not. So it will vary from job to job. Again, just be prepared to read all of the requirements before applying. What Are the Hours at Shmoop? Most of the employment-type jobs are during regular business hours, but the freelance jobs didn’t seem to have set hours. So there is flexibility there, although some of the freelance jobs did appear to have tight deadlines. If you apply to the freelance-type jobs at FlexJobs, then you are an independent contractor. You will be responsible for maintaining your computer and responsible for your own taxes at the end of the year. How Much Money Can You Make With Shmoop? The money will vary depending upon the position in which you are applying. Most of the FlexJobs did not mention salary, but requested that you include your rate. What is My Impression of Shmoop? I loved reading the website and getting a feel for the culture of Shmoop. It sounds like a good opportunity for the right person. What Do Others Think of Shmoop? Glassdoor gave Schmoop a 3.6 out of 5 star rating with overall favorable comments being made. You can certainly read them here. As far as Shmoop’s contribution to the academics, Educational World gave them 4 out of 5 stars. You can also read that review here. How Can Interested Individuals Sign Up at Shmoop? Just go to the website and select the job that best matches your experience then follow the instructions for applying and sending your resume. However for a remote or freelance position, please go to FlexJobs and do a search. Good luck to all who apply!